Supporters of Catalan independence are often asked why they aren’t happy with their region’s level of autonomy. The short answer is simple: We want to live in our own country, just like everybody else. Unionist politicians often rebuke their critics with the platitude that Spain is already one of the most decentralized countries in the world. But is it really? No American, Belgian or Scot would accept devolved powers that could be overruled by a simple majority in the national parliament without consequences, as happens here. On paper, Catalonia has home rule. In reality, not much is left. Thanks to Spain’s centralist zeal, Barcelona’s suburban trains, its airport and even its harbor are tightly controlled by the government in Madrid. In Germany, by contrast, the city-state of Hamburg owns and controls its suburban train network, airport and seaport, without calling into question Germany’s unity. In the United States, the criminal code is determined by all 50 states. In Catalonia, we can’t even have our own High Council of the Judiciary. Every institution is tightly controlled and limited by the central government. To add insult to injury, more than 40 years after the death of dictator Francisco Franco, Catalans are still being discriminated against for speaking their own language. In one of countless examples this year already, a university professor was fined €601 for daring to speak Catalan to a Spanish police officer at Barcelona airport. There were two decisions by the central authorities that served as the conclusive detonators for the independence movement. One was Madrid’s repeated refusal to comply with public investment commitments in Catalonia. The other was the Constitutional Court’s 2010 judgment on the Catalan Statute of Autonomy, whereby the court, acting at the behest of Madrid’s governing Popular Party, presumed to correct the Catalan people’s democratic will. The court modified and cut back a text approved by the parliaments of Spain and Catalonia and, most importantly, by 73.9 percent of Catalan voters in a binding referendum. The court — whose members have clear party links and are suspected by many of following party lines — did the conservatives’ dirty job and imposed the party’s agenda. In doing so, it violated the constitution it is meant to protect. This is nothing new. Successive Spanish governments have violated Catalan autonomy with impunity. They have pushed through legislation on issues over which they have no mandate and challenged perfectly constitutional Catalan decrees, thus automatically blocking them. Meanwhile, Spanish Prime Minister Mariano Rajoy’s administration has failed to comply with 34 Constitutional Court judgments that are favorable to Catalonia. Spain’s congress and government have repeatedly turned down requests for a binding referendum on independence — a measure that enjoys the support of as many as 8 out of 10 of the region’s residents, according to most polls. 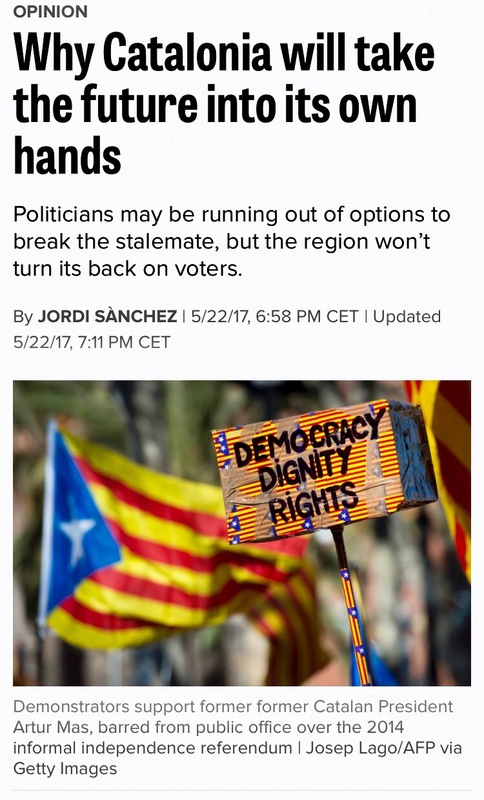 Indeed, more than half of the Catalan population says it would support a binding referendum — even if holding one was prohibited by Spanish law or opposed by the government. Polls also show that an overwhelming majority would accept the result of a referendum, whatever the result. Catalonia is a mature society, and its leaders are willing to compromise. But, after three electoral cycles driven by the issue of self government, its representatives have run out of options for a negotiated solution. After 85 out of 135 Catalonian MPs agreed to organize an independence referendum, Madrid responded by prosecuting and convicting former Catalonian President Artur Mas and three of his colleagues for fulfilling their mandate. Madrid took issue with Mas’ support for a 2014 non-binding popular consultation on independence, in which some 40 percent of voters took part — 81 percent of whom were in favor of independence. Catalonia’s speaker of the house Carme Forcadell and four of her colleagues are also set to appear before the court for debating independence. How is it possible that Spain, a member of the European Union, is unable to solve a peaceful conflict that affects 20 percent of its population? As members of civil society, the Catalan National Assembly (ANC) defends Catalonia’s right to vote on independence. Given the political stalemate, we support the Catalan government and parliament in their commitment to hold a referendum whatever the circumstances. Catalonia’s appeals for political independence do not come from party headquarters. Every year, up to 2 million people have taken to the streets to claim the right to vote on independence. This kind of engagement — in a region of little more than 7 million people — is what brought about the ANC. Organizations like ours — which are not affiliated with any political party — are the guarantee that a solution will be found through the ballot box, not a backroom deal. The EU is founded on the respect of human rights — including those of minorities — human dignity, freedom, democracy, equality and the rule of law. As such, it cannot afford to turn its back on so many people clamoring for the right to vote. What message does it send to the world if its own members are unable to apply its basic values? The Catalan parliament has approved its government budget for 2017. Its next item of business will be the adoption of a “transition to independence” law, to be ratified in the referendum planned for September. Rajoy, as expected, has vowed the referendum will “never” take place. But no government official appears to be willing to explain how they plan to prevent it from happening. Should Madrid resort to coercive policies, the ANC will be there to make sure our elected officials can deliver on their pledges to voters. If we have to mount a camp and sleep in front of parliament, we will. If we need to stand in front of the Spanish police holding nothing but our ballots, we will. We will defend democracy in Catalonia, and by doing so we will carry the torch of European values. Jordi Sànchez is president of the Catalan National Assembly (ANC), a grassroots organization that supports political independence for Catalonia.